There are a huge number of improvements in this BETA compared to the last version, though unfortunately I did not have chance to get all of the features I wanted in there but the majority of them are up and running and the rest will be coming in the final BETA (which should be out on the 20th January). Thank you to everyone that provided feedback, it was all very positive with plenty of people saying even the first BETA was better than the tools they are currently using, so that was very encouraging. I received some great suggestions for additional features as well, and a couple of bugs that were reported which of course have all been fixed for this BETA (and hopefully no new ones introduced!). As a token of my appreciation I will be sending a small reward to everyone that did provide feedback, and don’t worry if the feature you requested is not in this BETA, it will make it into the next one. 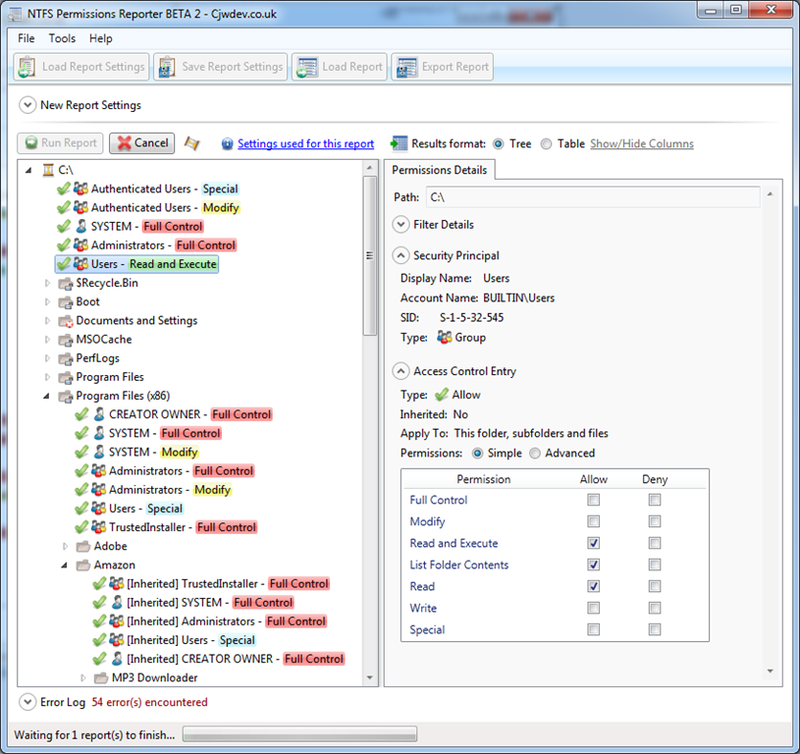 “Report Permissions” option added to menu that appears in explorer when right clicking on a folder – this launches NTFS Permissions Reporter and starts reporting permissions for the folder that was right clicked on straight away. Added right click menu to table view that allows information to be copied to clipboard and other options. Additional copy options added to right click menu on tree view. 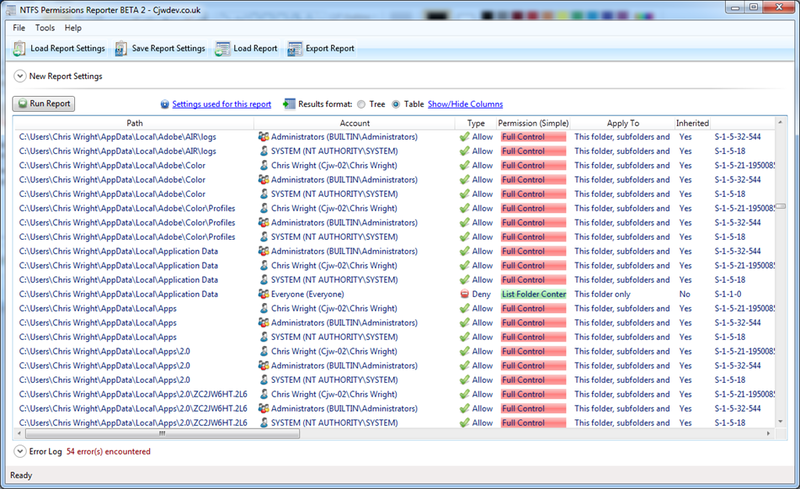 Added SID column to table view and CSV export. “Inherited” column in table view shows Yes or No rather than True or False. Fixed a bug that meant unchecking the option to get full display names from AD also meant user and computer disabled state would not be retrieved. Error log is now a grid with the following columns: Date/Time, Type, Error Details, and Path. Right click menu added to error log, with options to copy selected error details to clipboard. The “Apply To” details for each permission entry can now be used in filters. The “contains” and “does not contain” operators are no longer case sensitive. Load Report Settings button and Save Report Settings are now up and running. 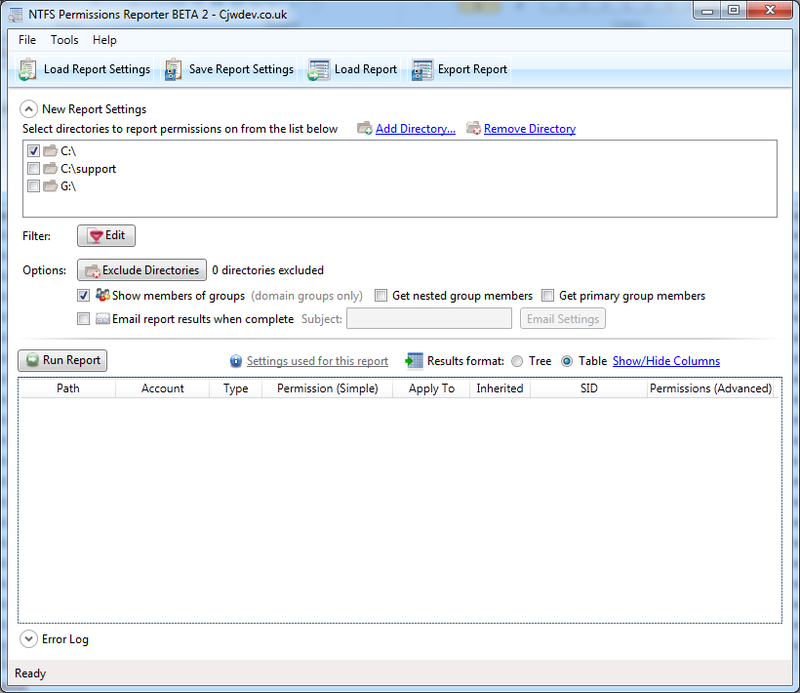 Added link above report results that shows the settings that were used to generate the current report and lets you save them to XML file to be used in future reports. 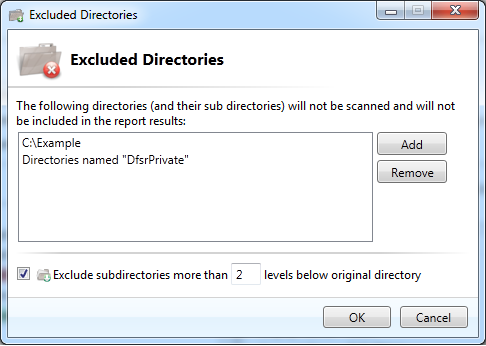 Added an option to the exclude directories window that lets you exclude subdirectories more than a specified number of levels beneath the original directory. Computer accounts used in ACLs are now identified correctly instead of being shown as users. The option to show group members is now working. Added a new setting to the Options window that lets you choose whether or not group membership information should be cached. As always I’m keen to hear what you think of the changes and any suggestions for improvements are more than welcome. Still hoping for the ability to import a list of shares (or even better a list of servers for you to find the shares on) but this is still a damn saucy bit of code…. Thanks a lot Mark 🙂 The feature to import all (or as many as you like) of the shares on a specified server will definitely be in the next BETA. Great job! Even though it is a beta this is one of the best NTFS reporting tools I have found. I have a couple of suggestions regarding the Export Report. I often need to present security information to different audiences, requiring different levels of detail or organization. It would be helpful to be able to customize the output of the HTML report, showing more or less details or sorting by different items. Maybe a choice between the table or tree format. And adding some color coding. Thanks. Thanks for the positive feedback Boyd 🙂 and yeah I’m already planning to add some more options to the export window, so that you can choose which columns you want for both the CSV and HTML format (at the moment CSV just outputs everything and HTML respects the columns you’ve hidden in the Tools -> Options window). I’ll also try and add an option for the HTML output to choose whether or not you want the permissions to be highlighted in different colours in the same way they are in the program. As for the tree view, I’ll be honest I’m not sure if there is any way that I could do this in the HTML report as I’m not great with web development but I’ll look into it. I did consider making a free “viewer” version of the program that only has the ability to load reports that have already been generated, as then you have all the functionality of the program rather than being restricted to a simple HTML or spreadsheet format. I’m not sure how many people would be interested in that really though. What do you think? This looks great so far. There’s a couple of features that I’d like to see added that may already be on the roadmap since there’s place holders in the GUI that seem to relate. 1. Schedule reports to run automatically. Command line could be used with task scheduler. Would be good if once settings are configured to show command line needed. 2. Compare report to previous report and report changes only. Would be nice if this was part of the report setup so when the scheduled job finishes gathering info it automatically did the comparison and emailed the results. Keep up the good work. Your apps are great! Just a quick look at this and it seems to meet almost all of my needs. Except…what about files? 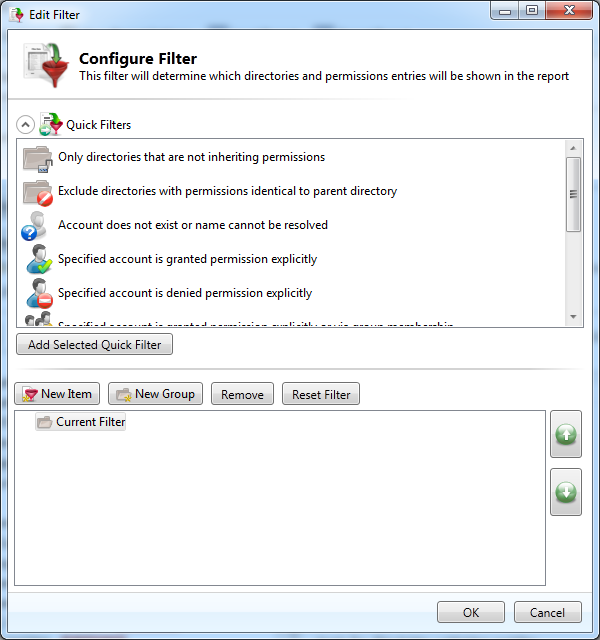 Would be really helpful to have a quick filter option to identify “Only files with permissions different than parent directory”. Beyond this, I have not found any other need to capture file perms. Always something, right? And something to consider down the road a bit….some other tools I’ve looked at have a feature to do a “what has changed since last time I ran this report”. Which is nice for double checking behind changes (and looking for unauthorized ones). And with the export to csv I can create a pivot in Excel that will provide the “management reporting” I need for QC review and sign-off. Really fabulously done! I have been a permissions seeker since ye olde dumpacl (from somarsoft) days and have tried and failed to write my own. This combines a lot of the most useful features from the suite of tools I’m attempting to use now. Looking forward to the final. Thanks. Thanks Jennifer, I’m afraid at the moment there are no plans to include files but I agree it would be useful to just see files that don’t inherit permissions, so once the first release is out I will start to look into it.